At the moment, Tyga doesn't have much to say about the news of Kylie Jenner's pregnancy. 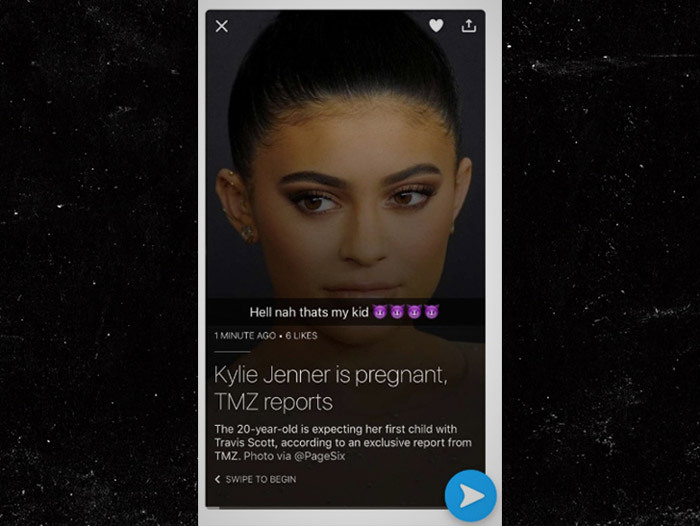 Well shortly after the news surfaced online, Kylie’s-ex boyfriend Tyga, took to his snapchat (which has since been deleted) and reacted to the story. “Hell nah thats my kid” Tyga wrote along with four purple devil emojis. He tried deleting the post immediately, but not before someone was able to capture a screenshot (see below). Then only a couple hours after reacting on Snapchat, T-Raww was spotted in the downtown streets of LA by TMZ, and was once again asked about the news in person this time. Unfortunately, he refrained from giving us any words or opinions on the pregnancy. In fact, Tyga acted like the photographer was barely there as he and a buddy walked down Rodeo Dr. before hopping in his Bugatti Veyron and speeding off (see video below). According to sources, Kylie and Travis are reportedly expecting their first child in February. Check out the TMZ clip (below). If you missed it, we recently published a "twitter's reaction" story to the news, which you can peep right here to see what others had to say about their pregnancy (it’s a pretty good read).